Here’s what’s up in the world of TV for Tuesday, November 25. All times are Eastern. 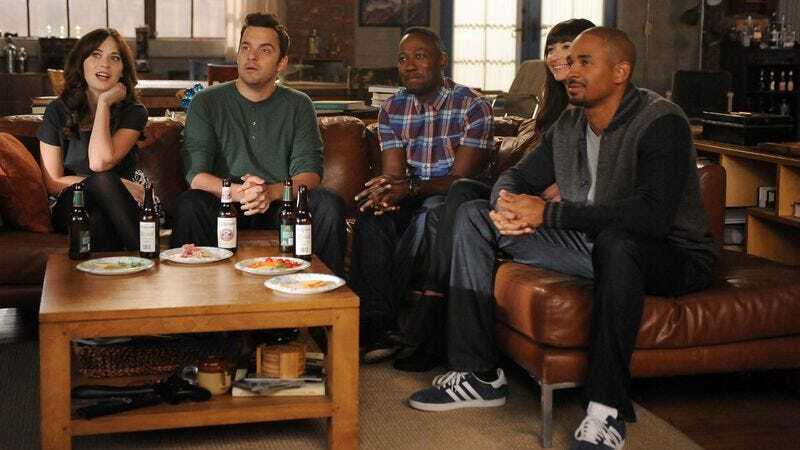 New Girl (Fox, 9 p.m.): The parade of Thanksgiving episodes continues with New Girl’s entry, as Schmidt uses the holiday meal as an excuse to play matchmaker in his inimitably convoluted style. His plan, which involves everyone bringing as a guest a potential romantic interest for someone else, appears to hinge on the apartment dwellers looking past their own self-centered interests when it comes to matters of the heart. Erik Adams bets this is going to go really well. The Mindy Project (Fox, 9:30 p.m.): Despite this being Thanksgiving, not Valentine’s Day, love is in the air in Fox’s Tuesday night sitcoms, as Mindy tries to use a blind date to find true love for Danny’s mom. Gwen Ihnat sees that as the optimal way to find love for people’s scandalous mothers. The Flash (The CW, 8 p.m.): The big Arrow crossover will wait for next week, but in the meantime another character from The CW’s superhero flagship will make the trip to Central City, as the Clock King shows up to take Joe and Iris hostage. Scott Von Doviak doesn’t care for Clock King’s criminal behavior, but he does appreciate the man’s flair for punctuality. King Of The Hill (Cartoon Network, 8 p.m./8:30 p.m.): Tonight’s syndicated King Of The Hill offerings represent a pretty incredible one-two punch with a pair of all-time classics. First, Hank becomes the substitute shop teacher in “Little Horrors Of Shop”—even cut off from sweet lady propane, this episode may feature peak Hank Hill. And then Connie gets her first period in the ominously titled “Aisle 8A.” Seriously, folks, I was this close to making a pair of decade-old King Of The Hill episodes the top pick. A Night At The Movies: George Lucas And The World Of Fantasy Cinema (TCM, 8 p.m.): Whatever one might think of George Lucas’ understanding and appreciation of his own work, he tends to be pretty on point about the classics of the genres that inspired his films. In this 75-minute special, Lucas will be talking about everything from King Kong and The Wizard Of Oz to Back To The Future and Labyrinth. The Sisterhood: Becoming Nuns (Lifetime, 10 p.m.): This miniseries looks at the lives of five women who are considering becoming nuns. Tonight’s premiere is called “I’m Not Ready!”, and I will now be very disappointed if the show doesn’t go into each commercial break with one of the nuns turning to camera, throwing up her hands, and exclaiming, “I’m not ready!” I think it’s the exclamation point that does it. Awkward (MTV, 10 p.m.): Yeah, Awkward is a pretty grim shadow of its former self, but it’s still worth pouring one out as the show wraps up it latest season. Tonight’s season finale is the second half of a story prominently involving a beach house in Mexico. I don’t know how the show is ever going to find any awkwardness in the tsunami of awesome that is a bunch of high school idiots partying in a Mexican beach house. Nixon/The Master (TMC, 6:40 p.m./10 p.m.): These lengthy historical epics represent Oliver Stone at his most Oliver Stone and Paul Thomas Anderson at his most Paul Thomas Anderson. I’m going to go out on a limb and say one of these films is slightly better justification for its director going for broke than the other. The Day The Earth Stood Still (FXM, 8 p.m.): Hey, maybe if we all just wish hard enough, this will transmute itself into the classic 1951 version. In the meantime, fair warning: This is the just-sorta-there Keanu Reeves version. College Basketball: Maui Invitational (ESPN, 7:30 p.m./10 p.m.): I bet a trip to Maui is fun. I bet being a college basketball star is lots of fun. But I’m guessing we’re dealing with some destructive interference, as flying thousands of miles to play basketball with barely any time to enjoy Hawaii is probably … well, it might still be a little fun, but only a little. Fortunately, fans just get to enjoy the end result, which features championship contender Arizona and a whole bunch of feisty challengers, including Kansas State, Pittsburgh, San Diego State, and ultimate upset merchant Chaminade. Gotham: Kyle Fowle takes a look at the latest episode, concluding that Donal Logue and Sean Pertwee should get their own spin-off all about the adventures of Bullock and Alfred. As a fan of Terriers and of people tangentially connected to Doctor Who, I heartily endorse this.